This is a mini-snowman in a walnut shell. 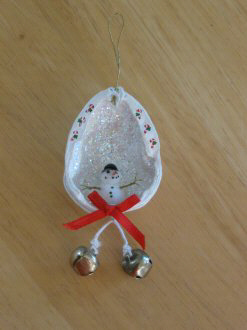 I have made lots of Christmas ornaments throughout the years and this was my Dad's favorite, my submission is in his memory. Editor's Note: Although there were no instructions included with this submission, we'd like to thank Donna for sharing this VERY special ornament with us! Copyright © 2008 by Donna Cwik. All rights reserved.